I’m nine episodes into Persona 4: The Animation, the anime adaptation of the excellent PS2/Vita RPG; as I would like to eventually finish the game (I am “only” 30 hours in), I have paused at this point in the anime to avoid spoiling myself. The anime is a lot of fun, worth the money I spent on it… and yet, I can’t shake the feeling that it is a guilty pleasure. The anime does a number of things right. 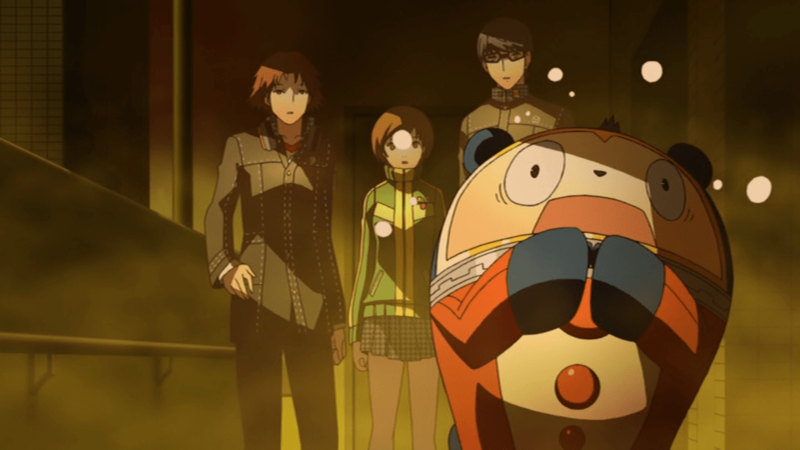 For one, it has very strong source material, with a great premise: Persona 4 follows several teenage friends who, in the course of investigating murders in their sleepy country town, end up fighting their own literal and metaphorical demons. P4’s characters are goofy (perhaps a bit more so in the anime), amusing (I’ve laughed so hard, the other passengers on my commute probably think I’m bonkers), and yet human and relatable. The anime’s fight scenes are spectacular – the titular Personas have never looked better – and its production values are excellent; the anime’s art is vibrant and attractive, and I routinely grin when it uses music from the game’s soundtrack. So what’s the problem? I think it lies, again, with the source material. P4, the game, has (from all I’ve seen) a very good story, and the anime follows it faithfully. But what produces a well-told game story does not necessarily work in other media. In particular, the game is long (~90 hours, compared to the 13-hour anime), and it features a silent protagonist, the aptly named Yu. But while its main plot is linear, there’s plenty of room for the player to flesh out Yu by (a) choosing how, and with whom, he should spend his free time, and (b) picking dialogue options that, while not really significant, still paint an image of his personality. My Yu is a loyal friend to his buddies on the investigation team, a diligent student and part-time worker, and a fan of the beef noodles at the local Chinese restaurant. But he has little time for that bratty girl who manages the basketball squad. If you play the game, your Yu will have priorities of his own, and that will cement him as a distinct character in your mind. By contrast, the anime suffers from multiple limitations. First, the game’s main plot has a distinct rhythm – but it’s masked by the amount of time it takes to play through, and by all the side activities the player can indulge in. But the anime has to flit from major plot point to major plot point, and that lays bare the formula beneath. Second, in the game, Yu’s/the player’s agency are most visible in side interactions, but these are exactly the ones missing from the anime. So anime Yu is a poor protagonist; he doesn’t drive the plot so much as get carried along for the ride. And third, anime Yu is still mostly silent – but while this works in a game (it’s easy to imagine the player character saying things off-camera to NPCs), in other media it just leaves the quiet character at best, as the strong, silent type, and at worst, downright bland. In this case, anime Yu ends up being just one member of an ensemble cast, and while his powers may be extraordinary, his personality isn’t. At this stage, then, my impression of the anime is that it is essentially fanservice for people who have played the game. If you are familiar with Yu, Chie, Yosuke, and the rest of the gang, this is still definitely worth a look; P4’s characters are as charming and funny in anime form as they ever were in the game, and I’ve really enjoyed revisiting them. But I would have a hard time recommending that someone who’s never played the game splash out sight unseen for the anime. Watch a trial episode or four first, then decide if it’s worth your money.